Nora Webster is a book about…. Well, I wasn’t really sure for a good while, except that it was patently about Nora Webster. The clue is in the title, but there was little else to give anything away on the jacket cover of the hardback. Rewind a little. I bought this book at Cheltenham Literary Festival 2014. I loved Brooklyn, I joined a queue in Waterstones and got my book signed. And a year later, I started reading it. I love Toibin’s writing, and was enjoying this, when I realised I wasn’t really sure where the book was going. The jacket cover gave little away – actually it said it was about selling a family house, but that happened early on, so the book couldn’t really be about that, just selling a house. Toibin’s writing kept me going, until I was somehow embroiled in the Webster clan (both alive and dead) and was curious to know what happens. Only I never really did find out. What I love about the book is the writing. 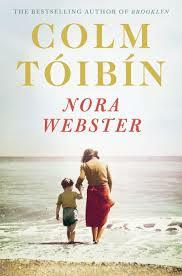 Toibin’s pared down writing, where every word counts and mirrors the rather evasive protagonist, Nora Webster. I love the ordinariness of the book, that it is paints a picture of everyday life in late 1960s in Ireland. Toibin’s descriptive writing makes you believe you are in the room with the family. Toibin is a master of capturing the time and setting with small, seemingly insignificant details. What frustrates me about the book is the lack of story. There is no variety in the movement of Nora Webster, the book merely trundles on at the same steady pace, certainly a mirror of her life, and it feels weighty because of it. The book doesn’t end, either, merely draws to a close, after the most moving episode where Maurice (her deceased husband, who’s dead at the beginning of the book, so this isn’t a spoiler) appears in front of her. I finished the book with a massive sense that it wasn’t finished. Not even Nora Webster, but neither for anyone in her family. But perhaps this is a spark of genius too, because there is so much scope to get lost in thought of the characters and the themes. Nora Webster is a study in grief. Nora Webster has shades of Stoner, both quiet, introverted people, strangers to themselves in many ways. I think that Toibin reveals things to the reader that Nora doesn’t seem to pick up on, and this made me want to shake her at times. Did she really not see herself as attracted to her daughter’s boyfriend? Did she really think there was nothing amiss about sending her two boys to live with an elderly aunt for the months when Maurice was dying with no contact? As Nora begins to find herself, or rather, stumble on herself (she’s too passive to make many stands), she looks back at her relationship with her mother. I wondered if the story were to continue that the same pattern would emerge with her children, and their distance and disdain for her. Since finishing Nora Webster, I read that Nora Webster is based on his mother, her grief. Someone hinted that Donal might be Toibin. I don’t know if that’s true, but if there’s a shred of truth, perhaps Nora Webster is about exorcising the ghosts of the past, and that Toibin couldn’t bear to finish the story. Perhaps it is his offering of understanding. I love it that a book makes me put it down, in some frustration, and then asks questions of me. Questions that have no answers, only assumptions based on presumptions. Whatever it is, Toibin remains one of my favourite writers, and I certainly don’t regret the hours spent with Nora Webster. All I ask of him next time is to put the reader back in the picture and allow the book to end, rather than just drift off.